Crystal Group closely collaborates with Intel to deliver cutting-edge, enterprise-level capabilities to applications requiring rugged hardware. Hiawatha, Iowa USA, March 20, 2017 – Crystal Group Inc., a trusted designer/manufacturer of rugged commercial off-the-shelf (COTS) and custom computers, displays, switches, and storage devices, has joined the Intel® Internet of Things Solutions Alliance, reaffirming its longtime commitment to delivering revolutionary technology in rugged and reliable systems. Over the past 30 years, Crystal Group has designed, manufactured, tested, and delivered highly reliable computer and electronic systems that leverage the most advanced hardware and software available. As an Intel Technology Platinum Provider, Crystal Group adheres closely to the Intel Roadmap to bring the very latest Intel innovations to aerospace and defense, automotive, commercial, industrial, and other discerning customers quickly and efficiently. Now Crystal Group takes the Internet of Things (IoT) and enterprise-level capabilities to the edge, through its expanded relationship with Intel and participation in the Intel Internet of Things Solutions Alliance. 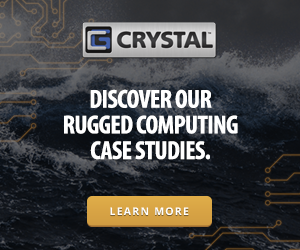 Crystal Group and its broad portfolio of ruggedized, field-tested products put powerful IoT technologies and countless enterprise capabilities within reach of customers and applications in harsh environments – whether land, sea, air, or space – where traditional computer hardware would be destroyed. The Intel Internet of Things Solutions Alliance is a global ecosystem of more than 500 industry leaders and more than 6,000 solutions – including Crystal Group servers, workstations, embedded computers, networking equipment, storage systems, and displays – helping to fuel IoT success. From modular components to market-ready systems, Intel and the 400+ global member companies of the Intel® Internet of Things Solutions Alliance provide the performance, connectivity, manageability, and security developers need to create smart, connected systems. Close collaboration with Intel and each other enables Alliance members to innovate with the latest technologies, helping developers deliver first-in-market solutions. Learn more at: http://www.intel.com/iotsolutionsalliance. © 2017 Crystal Group Inc. All rights reserved. All marks are properties of their respective owners. Design and specifications are subject to change.